Worse than Jade Blossom in Wild, but not strictly worse thanks to Excess Mana. Still, this would have been better off in the Hall of Fame... maybe they'll pull a Molten Giant and un-nerf this upon retiring it. I think its time to sent this into dumpster hall of fame. So sick of druid's mana cheating. Every druid has this card. Insanely difficult to mulligen this card. It's very heavy, will almost always be in the last card draws of your deck. While it's a very good card, you rarely see it, or get to use it until you have close to 10 mana. Might start replacing this card with something more useful. Only 62% run this? Woah. It's a good card. It helps if it comes at the beginning of the game and it helps drawing a card exactly when you need it (most of the time, right before the end of the game). 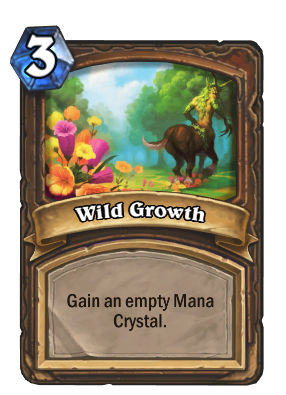 I'm using it in all of my Druid decks, and once you've experienced enough of Druid decks you would know how important this card really is (the same goes with all of the Choose One cards, such as Wrath or Druid of the Claw). it never comes in the start of the game, ever. 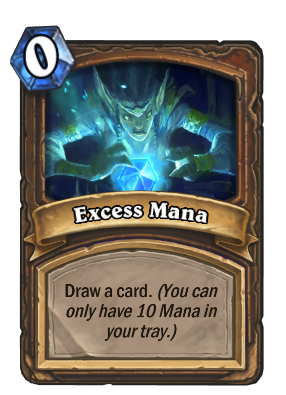 Completely worthless if it is the last card in the deck, as I discovered (the hard way) Excess Mana will draw fatigue if you don't have any cards. Oh, really? You are so clever then. Turn 3: Nourish. Turn 4: Nourish. Turn 5: 10 mana.